Most team sports have some form of all-star game, a kind of fantasy league made up of preeminent players. Test of Tyme took that concept out of the arena and put it to use in the field of home remodeling and interior design. The firm is a triumvirate of Monterey Peninsula professionals: Don Whitaker, Scott Coulter, and Susana DeFatima Silva encompassing, respectively, the disciplines of woodworking, painting and finishing and real estate/financing. All three are recognized masters of their vocations. Prior to joining forces, all three Test of Tyme partners operated respected, successful businesses. 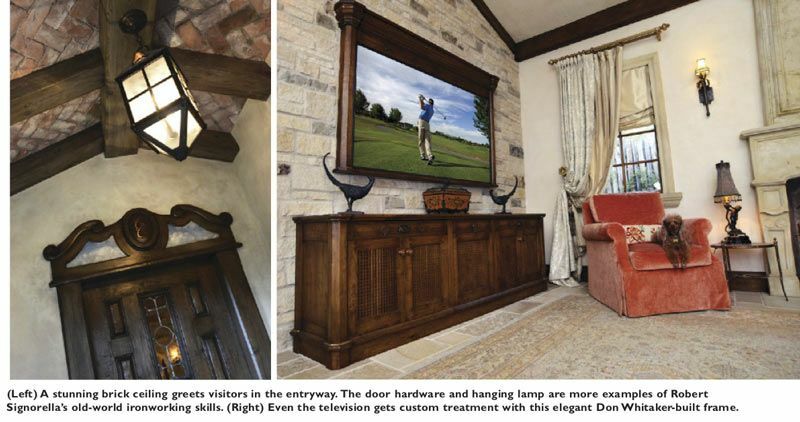 The Golden Hammer is Whitaker’s cabinetry, custom millwork, and furniture design firm. 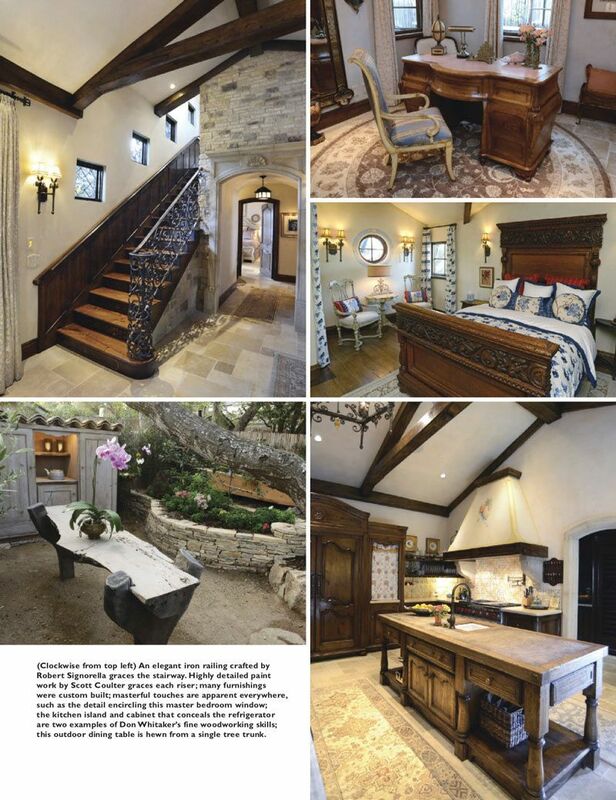 In his 40 years in the trade, this Monterey native has garnered many awards for his exquisite carpentry work. Coulter heads up Time Honored Finishes, providing custom painting and specializing in rustic, Old World finishes plus antique revitalization and restoration of artworks such as sculptures and paintings. Between them, the two have performed renovations on more than 350 of the most prestigious homes in Pebble Beach and Carmel. Silva is a Keller Williams real estate agent, specializing in luxury residential properties and has more than 20 years of experience in project management and property development, with international connections. Test of Tyme was formed in 2008 with the intent of buying, renovating and reselling properties on the Monterey Peninsula. Recently, the trio has branched out into performing work for individual homeowners. One such example is the South Carmel home of Dale and Margaret Byrne. They purchased their lot with approved building plans in place. A lucky find of some 150-year-old French roof tiles, combined with meeting Coulter, resulted in an Old-World French design. Named “Carmel Ciel,” (“Carmel Heaven”) the Byrnes’ compact, comfortable home has been transformed into a supremely livable French provincial masterpiece. “Pretty much everything you see in this house was custom and handmade by us,” Coulter says proudly. To achieve the effects he’s looking for, Coulter makes his own lime paints and hand rubs finishes until they glow as if they’ve been in place for centuries instead of mere months. The drapes were made by Coulter’s mother and hung on curtain rods crafted by Carmel metal artist Robert Signorella. For his part, Whitaker’s woodworking is without peer. Painstakingly carved wood surfaces are everywhere in the home, from the imposing oversized kitchen cabinet that cleverly disguises the refrigerator to the intertwining shapes surrounding a guest-room bathroom entrance, to the frame around the flat-screen living room television, all subtly scream quality, good taste and attention to detail. And as the Byrnes can attest, Test of Tyme succeeds in that aspiration.